What’s so great about kayak snorkeling in Belize? 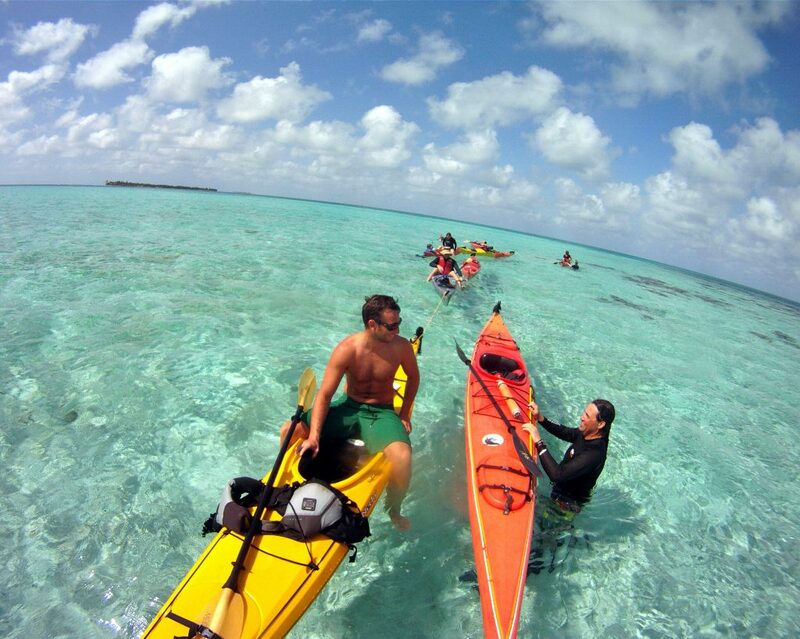 We have a lot of sports on the island, but the one we do every day and sometimes twice a day is kayak snorkeling. This is something you can’t do everywhere in the world, so often even kayak instructors have never experienced it. There are over 900 patch reefs at Glover’s Atoll where our island is located. They offer fantastic snorkeling, but there is no land near the patches. So we paddle up to them, the guide jumps out and secures his or her boat, and then ties everyone up to each other, making a long line of kayaks like you see in this photo. Often, the water is over your head, and so you must be able to get in and out of your boat without tipping over. This is the trick we teach you on your first full day on the island. Everyone has to demonstrate they can do this before going on a kayak snorkel expedition. You wouldn’t want to paddle a half mile from the island and jump out and then not be able to get back into your kayak! It’s also quite a gear shuffle, getting your lifejacket, hat, sunglasses, and paddle off and stowed, and getting your fins, mask, and snorkel on. We teach you the whole process. First you test it out near the island, and then we go kayak-snorkeling that afternoon to practice what you learned. It’s my favorite sport. The number of creatures we see is amazing!